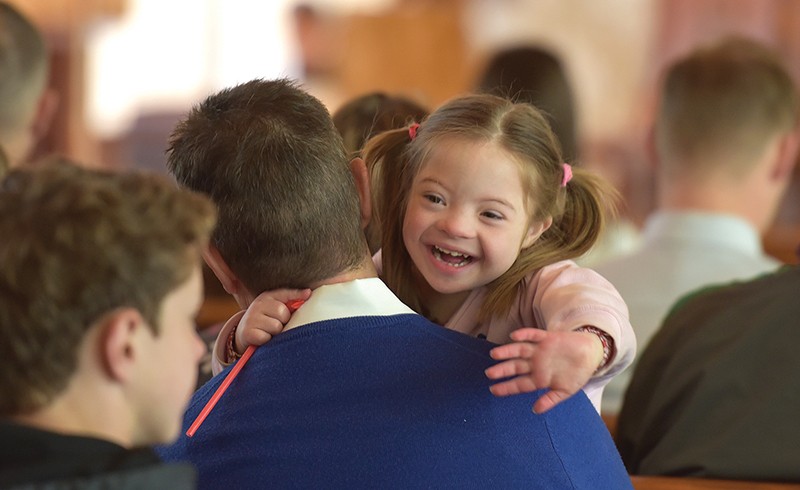 Toby Cook holds his daughter Caroline, 6, during a World Down Syndrome Day Mass at St. James Academy in Lenexa on March 21. Hosted by Audrey Amor’s life skills class, the Mass was part of a larger celebration to show those with Down syndrome and their families what a positive light they are in the world. LENEXA — Approximately one in every 700 babies in the United States is born with Down syndrome. On March 21, to celebrate World Down Syndrome Day, St. James instructor Audrey Amor and her life skills class hosted a Mass for families of children with Down syndrome to show them just what a true light they are to the world. “I really was hoping they would see this as a celebratory thing,” said Amor. Amor’s life skills class currently includes two students with Down syndrome — sophomore Bella DeBrevi and junior Jack Farnsworth. The rest of the class is made up of three peer mentors — Megan Thomas, Alicia Koehler and Parker Kelley, all in their junior year. Amor and the mentors work with DeBrevi and Farnsworth to master skills for everyday tasks like washing dishes, doing laundry and shopping for groceries. The purpose of the class is to help students with special needs flourish outside of school. The class also carries out a larger project each semester to help the students grow in a constructive, supportive environment. This semester, the task was to plan a celebration that included Mass for families of children with Down syndrome, followed by a casual reception. “And they bring me so much joy,” she added. So Thomas and her peers did all they could to make the day special. The class spent two months preparing and conducting research on Down syndrome so DeBrevi and Farnsworth would understand what it is and how it affects their lives. When it came to the planning, DeBrevi and Farnsworth did everything from designing buttons that said “Nothing down about it” — which they handed out to families and fellow students after the Mass — to communicating with teachers about the celebration. “My students handwrote letters and sent them out to the families that we were inviting,” said Amor. Everyone who was invited was connected to St. James in some way, but Amor hopes in the future they can expand the invitation to other high schools and families in the archdiocese. All three of the peer mentors have found their experience with DeBrevi and Farnsworth to be an incredible gift. “My experience in the class has truly changed my life,” said Koehler. “I’ve found a love for working with Bella and Jack and am looking to continue a profession in special education because I feel I grow as a person when I’m around them,” she said. Koehler isn’t alone in that desire. Kelley also feels a pull toward special education in his future. “My experience so far has been really good and I have learned a lot,” he said. The students portrayed the love and appreciation they have for their fellow classmates through a video presentation during the reception. Produced by the life skills class and the St. James advancement team — a group of students who help the school in a variety of ways — the video features DeBrevi and Farnsworth alongside their peers and staff members. Those featured share how the two have impacted their lives and the school as a whole. As it played, DeBrevi and Farnsworth lit up with joy. Amor hopes everyone who sees the video walks away knowing that we all have our own unique crosses. “Some are a little more evident than others,” she said. “But this day was about celebrating who [DeBrevi and Farnsworth] are and the effect they have on our community,” she added. Kelley hopes the celebration opened people’s eyes to the happiness his classmates bring to the world, and that those with Down syndrome don’t feel isolated “because every single person is different in their own way,” he said. Koehler has one message for those with Down syndrome. “They should be confident in themselves,” she said. “There is nothing down about Down syndrome. To view the video, go online to: www.facebook.com/theleavenkc.